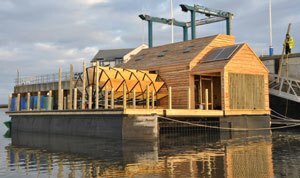 Amble Boat Company spent the winter building a most unusual structure, which is set to attract hundreds of visitors on the River Tyne in Newcastle. 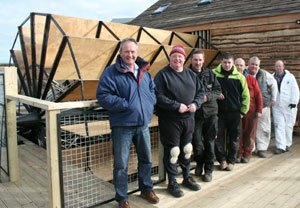 Two Amble businesses were kept busy for several months constructing Flowmill, a 14 square metre musical tidemill built with wood and steel. Nick Spurr of Amble Boat Company and Kris Burnett of KB Surveying tendered for the work and beat off competition from six companies, one Dutch and five located in the North East. Workers at the Amble boatyard constructed Flowmill which consists of two steel catamaran hulls connected together and upon which a timber frame mill house is attached. A giant wood and steel waterwheel drives internal artworks which in turn create sounds. The entire construction is powered by green energy. KB Surveying was responsible for the building regulations and structural supervision. Flowmill will be installed at Newcastle quayside opposite the Baltic. It will be open from 25th March for members of the public who will be able to walk around the floating structure and see and hear the artwork. “All six of our staff have worked on it through the last five months, ” said Nick. “It’s been a tremendous project. Right from the beginning it captured our imagination. Everyone involved has been very enthusiastic about it. And of course it gave us a meaty contract through the winter, so we could maintain our employment levels. ~Flow is part of Artists taking the lead, and is one of twelve extraordinary public art commissions funded by the UK Arts Councils for the London 2012 Cultural Olympiad to help celebrate the London 2012 Olympic and Paralympic GamesCultural Olympiad. 2 thoughts on "Amble’s water music flows into Tyne"
Wonderfull, me and my brother have seen the start of the construction of the Flowmill when we had motor problems last year and were forced to stay with our boat some days on the land at the Amble Boat Company. But we got to know a group of wonderful people we will never forget. We had no idea of how it would become and it is nice to see it ready. Now we have to find the sound somewhere. You can visit it on the River Tyne of course, and also hear the music at the BALTIC gallery on the Gateshead side of the river. Their website is here: http://www.flowmill.org/visit Sadly I don’t think they have anything online to listen to.